For almost two years now, since August 2016, I have had the honor to teach a class of “UMF” (unbegleitete minderjährige Flüchtlinge in German), or “UMR” in English: unaccompanied minor refugees 3 to 4 times a week. That is an amazing feat for anyone to accomplish. In addition, however, these young men and women are alone in a foreign country, far from their loved ones (if they have any left at all); some have even had to go through unspeakable things before or during their arrival. And yet: they show up to class every day, whether they slept—well or at all—or not. They do their homework, even though they live in noisy refugee homes with up to seven other inhabitants in their rooms. They are eager to learn and even more eager to contribute to society. However, Austrian law prohibits them from starting an apprenticeship or working at a job until their decision on asylum is positive. So, they do what they can: they help out in the community free of charge, go to school, learn about the country they would like to stay in. In short, they become model citizens. And yet: in a recent sweep of negative asylum decisions, many of my students are now faced with a return to Afghanistan; for some, a country they have never even seen in their lives. As German speakers, we come up with lovely compound nouns to describe the things around us. Much like a new term coined a few years ago, called “Integrationsbemühungen”, which roughly translates to “integration effort”. It means that those who try to integrate into Austrian society—by learning the language, starting an apprenticeship, helping out in their community for free, what have you—will be rewarded with positive asylum. Well, that might have been the case under a social government. Now, none of this seems to matter. Along with this, after months of uncertainty about the fiscal budget, it has now become clear that the new government in power will cut funding for adult education. Most notably for those trying to (re)integrate into the job market—and for asylum seekers. So here we are. After one and a half years of steady learning and a potential future in this country on the horizon— which they have to work harder for than anyone else—, my students are now faced with a whole different outlook. One without an apprenticeship or a school routine. Even worse: one of possible deportation by the police in the middle of the night. Because that’s how we do things here in Austria. I am a true believer in lifelong learning. 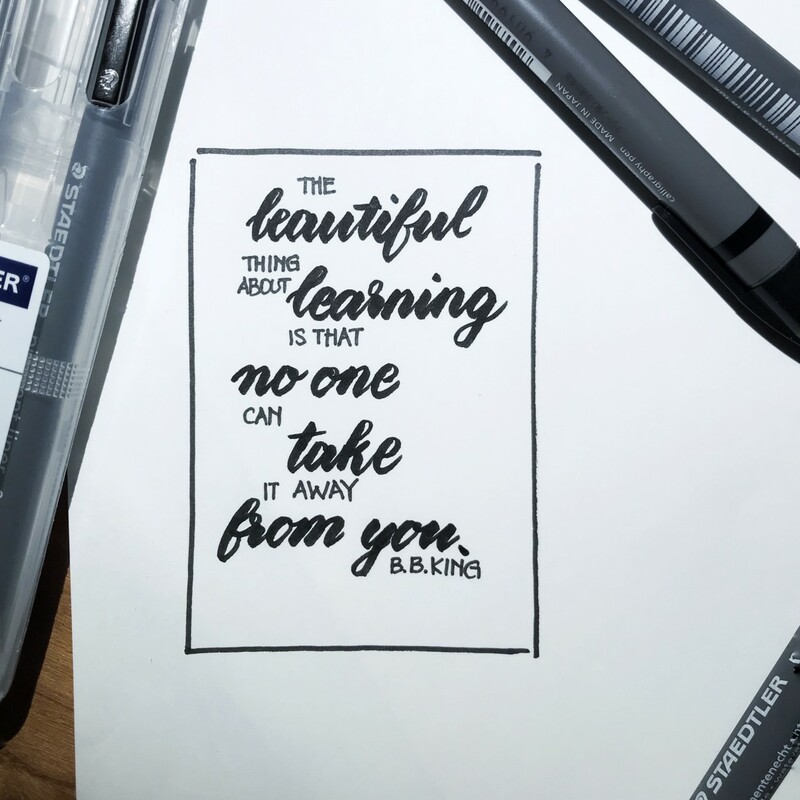 It is the basis for all the work I do—be it teaching, editing, or even lettering. And yet I feel like the past years are being nullified. Like they don’t count for anything. How, then, must my students feel? I can’t even begin to comprehend or convey my students’ emotions, and it is not my place to speak for them. So, I will simply leave here what I—as the teacher—am taking away from this awesome experience. I have seen shy students blossom into class clowns. I have been given a piece of fruit as a gift—daily. I have had the pleasure of instilling wonder for the German language through grammar (yes, you heard me: grammar rocks). I have been respected and listened to, from day one. I have helped students find methods to learn for themselves by trying out various learning strategies. I have been invited to dinner numerous times. I have been immersed in a multi-lingual environment in which Persian, Arabic, Turkish, Kurdish, Dari, Pashto, English, French, German, and Tyrolean dialect have been spoken—and played with. I have learned of the significance of soccer and team sports for young men. I have gained an understanding of the workings of government. I have seen teenagers grow into adults. I have profited from my colleagues’ wisdom. I have prepared students for exams and seen them conquer exam anxiety. I have helped students to continue on to further education. I have worked for a well-led institution whose team ensured funding in an underfunded field—again and again. I have benefited from said institution’s work ethic, which kept motivation levels high and resulted in a practically non-existent student dropout rate (of just 1%!). I have learned about other cultures. I have seen a people said to be lazy and criminal in nature be nothing but motivated, hard working and giving. I have learned about myself. I have been asked for advice in vital matters. I have become a role model and a friend. I have become a teacher.